What to know: The vocals are strong and secure, the musicianship is stellar and the production quality is solid. Kids enjoyed this. They got up and moved around. "I want to listen to that one today." They enjoyed the characters and found the music to be very danceable. "I danced with my seahorse and my friends." Most important though they liked it because "I like singing." 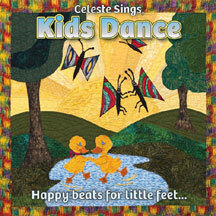 "Celeste Sings, Kids Dance" is a nice collection of upbeat tunes from an amalgam of writers including John Denver (For Baby), Tom Paxton (The Marvelous Toy) and Richard Starkey (Octopus's Garden), to name a few, and a couple of instrumentals, Music Box Dancer and Pachelbel's Canon, to round out the set. The vocals are strong and secure, the musicianship is stellar and the production quality is solid. My Mommy Comes Back is an uplifting, satisfying standout. I really enjoyed the performances - both vocal and instrumental. The recording quality is very good. It uplifts and embraces its intended age group. This project constantly supports love and happiness through a variety of song choices by a variant of artists. It is very appropriate and uplifting for young audiences. The quality is superior across the board. The music is quite appealing due to terrific production values from the vocals to the instrumental performances. I was a little distracted by the inclusion of the instrumental version of Pachelbel's Canon which I felt broke the momentum of the album. There is a lot for young ears to like and divergent styles and engaging vocals and sounds. Reviewed by John Wood. Happy beats for little feets.